Major League Baseball’s new commissioner, Rob Manfred, made it almost halfway through his first day in office before turning the Internet against him. In an interview with ESPN’s Karl Ravech, which aired on Sunday, Manfred brought up the importance of “injecting additional offense in the game.” The average MLB team scored 4.07 runs per game in 2014, the lowest full-season figure since 1976, so it’s unlikely that statement alienated anyone. It’s the next sentence that made Bud Selig’s successor the target of critical tweets. “For example,” Manfred volunteered, “things like eliminating shifts, I would be open to those sorts of ideas.” When Ravech pressed, Manfred confirmed that yes, he was talking about defensive shifts — the practice of positioning fielders in places where ground balls are likely to go — and that yes, he was open to outlawing them for the good of the game. Within moments, my feeds filled up with aggrieved responses, as outraged analysts ridiculed Manfred’s comments or blogged about bringing back Selig. Some perspective might be helpful here. Manfred’s top priorities, as reported by ESPN’s Jerry Crasnick, are perfectly reasonable: making baseball more appealing to a young audience, minting money and enriching the spectator experience with technology developed by MLB Advanced Media, improving the pace of play, improving the relationship between players and the league, streamlining baseball’s business structure. Restricting shifts can’t be any higher than sixth on Manfred’s list, and he’s capable of paying attention to more than one problem at a time. If you’re wondering how Manfred could think about banning shifts when he should be thinking about [insert issue of importance to you], don’t worry: One mention of anti-shift legislation doesn’t mean he’s ignoring more pressing matters. Better yet, he hasn’t canceled a single World Series. Manfred also isn’t the first person to suggest banning the shift: Sports Illustrated’s Tom Verducci and Grantland contributor Michael Baumann, among others, have made the same proposal. It’s not an inherently unreasonable idea: Despite the blather in Ken Burns’s Baseball about the national pastime’s divinely ordained distances between bases and unparalleled continuity across eras, baseball, like all sports, must be maintained. Nothing in baseball’s bylaws guarantees that offense and defense will always be in balance, or that the most efficient style of play will always be the most fun and fan-friendly. Individual teams are out for themselves first and the sport second: A GM who discovers a strategy that could save runs, win games, and make millions doesn’t wait to conduct a run-environmental impact study before putting it into practice. That’s where the commissioner comes in: Although Manfred works for the owners, he isn’t beholden to any one team. That makes him the one with the mandate to tear out the weeds and trim back the branches when the game gets overgrown. So, does unorthodox defense have to be ripped out at the roots? The shift’s purpose is to prevent hits. When it works in moderation, few mind it aside from the select lefty sluggers who see it most often. Migrating fielders give us something to look at between batters (or pitches), and when a shifted defender ends up in the perfect position to make a play, it’s a victory for fans of the defensive team. The shift also gives analytically inclined fans and writers more topics to dissect and debate: What makes a good shift candidate? Are teams shifting too little or too much? How do they determine where to position their fielders? And how can a front office persuade its players that shifting makes sense? As commissioner, though, Manfred can’t cater to a small subset of fans. And in theory, there’s a point at which the shift, like a Tribble or a child actor, stops being cute and starts being dangerous. Most hits are exciting; most ground ball outs aren’t. If the shift turns the former into the latter too often, it could make baseball more boring. And being boring isn’t in baseball’s best interests. It’s not uncommon for leagues to take drastic steps to preserve offense (and interest). When the pace of play in the NBA stagnated, the league instituted a shot clock. When the neutral-zone trap reduced scoring in hockey, the NHL called obstruction more liberally and lifted the prohibition on two-line passes from behind the blue line. In baseball, lowering the mound (or moving it back) helped dispel previous offensive slumps. The mechanics of outlawing the overshift would be complicated. MLB could simply decree that two infielders have to stay on either side of second base, eliminating the most lopsided alignments without adding any unsightly lines to the field. However, the edge cases are endless: Could infielders trade places with their counterparts on the other side of second? Could a third fielder stand directly behind the bag? How far could infielders range into the outfield and vice versa? Teams would test the limits, which would mean extra work for the umpires (and maybe an “offsides” replay view). Instead of imposing artificial restrictions, MLB could allow the threat — if there is one — to resolve itself. It’s true that many pull hitters who are convinced that they’ve been burned by the shift have refused to bunt in order to beat it, but there are some signs that their resistance is slipping: According to Inside Edge, there were 124 bunts against the shift last season, up from 66 in 2013 and 40 in 2012. And while it’s difficult for hitters who’ve grown used to hitting one way to adapt on the fly, teams could do a better job of drafting and developing players who hit the ball to all fields. We’re only a few years into the age of the shift, and it’s too soon to say that the same smart people who engineered the illness won’t also perfect the vaccine. More importantly, though, it’s not clear that the shift is significantly impairing offense on a leaguewide level. If the shift were working on a scale large enough to justify Manfred’s fear, infielders would be converting enough would-be singles into outs to lower the league’s batting average on balls in play. We have numbers to support our observation that the shift is becoming more common: According to Baseball Info Solutions, MLB’s shift total nearly doubled from 2011 to 2012; climbed by almost 80 percent from 2012 to 2013; and rose by more than 60 percent from 2013 to 2014. Over the same four-season span, though, leaguewide BABIP went up by two points; up by one point; and up by one more point. 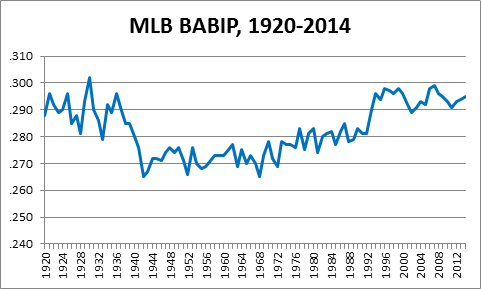 With shifting at an all-time high in 2014, league-average BABIP was no lower than it had been five years earlier or 20 years earlier, and significantly higher than it had been at any point between the mid-1930s and mid-1990s. 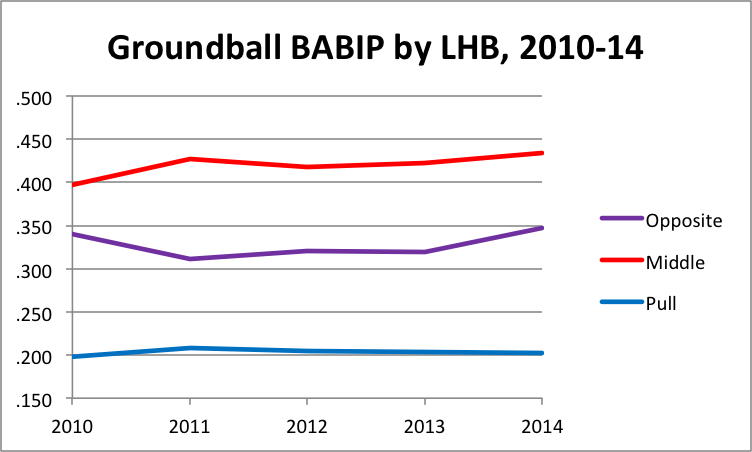 Nor has BABIP on ground balls alone sunk in recent seasons. If the shift were an existential threat to the sport, we probably wouldn’t have to dig any deeper than that, but let’s keep searching for the smoking spray chart. 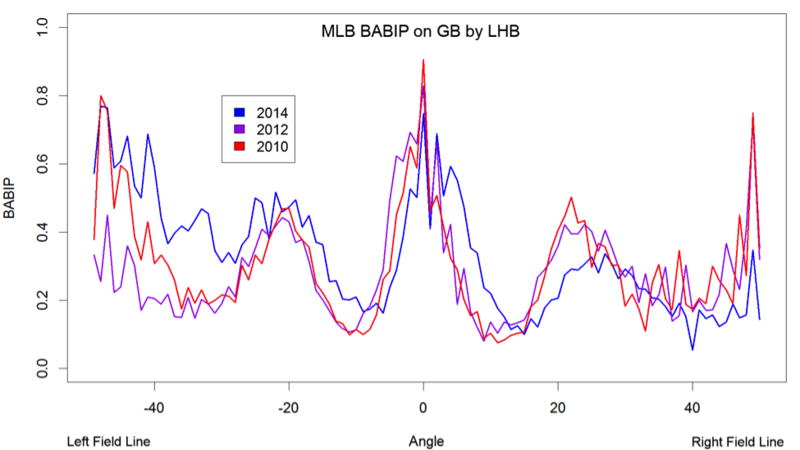 The graph below shows the average BABIP on ground balls hit by left-handed batters in 2010 (red line), 2012 (purple), and 2014 (blue), broken down by batted-ball angle from MLB Gameday data. Negative angles represent locations to the left side of second base; positive angles represent locations to the right side of second. The more extreme the angle, the closer the ball came to foul territory. 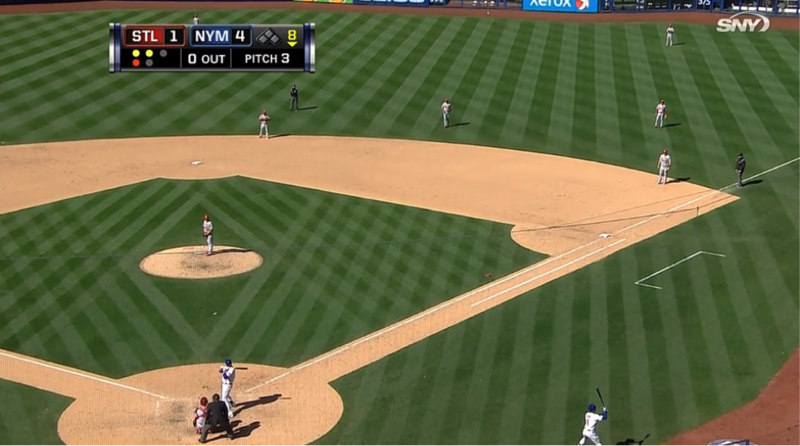 A ball hit at 45 degrees, for instance, would have hugged the first-base/right-field line. As one would expect, given that each side of the infield mirrors the other, the pattern is mostly symmetrical. It’s easiest to understand what we’re looking at if we start at the edges and work inward: At the extreme left and right, BABIP spikes mark locations where batted balls often slip between the bag and the closest corner infielder. Slightly closer to the center of the field, the lines dip at the angles where the first and third basemen typically stand, and then climb again in the regions where balls pass through the holes between third and short and second and first. The valleys on either side of dead center denote the middle infielders’ traditional stations, and the sloping spire in the middle tells us that the surest way to get a ground ball hit is to send the ball back the way it came. We would expect to see some differences in the BABIP plot for 2010, when teams shifted less than 20 percent as often as they did in 2014 (according to BIS). Sure enough, we see that left-handed batters’ BABIP was slightly lower in some areas on the right side of second in 2014 than it was in 2010 — compare the two lines from roughly 15 degrees to 25 degrees, and from 35 degrees to the foul line. However, the blue line (2014) is higher than the red line (2012) over large swaths of the field up the middle and toward third base. In their efforts to protect themselves from singles in some parts of the field, shifting teams are leaving themselves vulnerable to singles elsewhere. Right-handed batters aren’t shifted as often as lefties, but the corresponding graph for their ground balls seems to show a similar pattern: a lower BABIP in parts of the pull side (in their case, left field), and a higher BABIP in parts of the middle and opposite field. 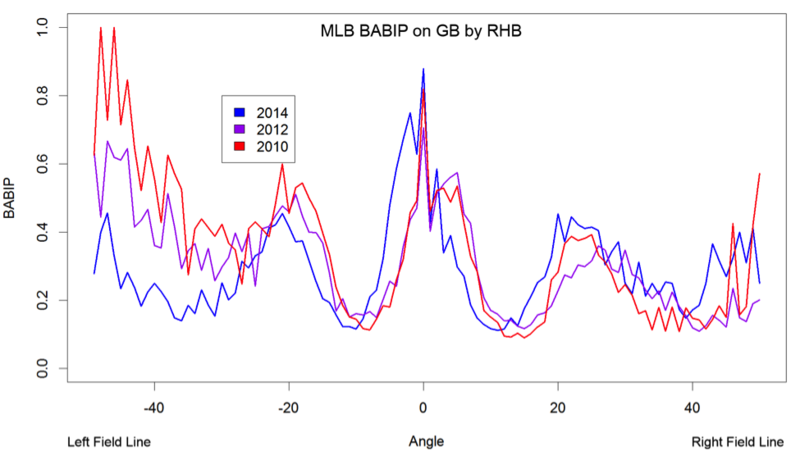 We can see the differences clearly if we graph the changes in ground ball BABIP by left-handed batters over the past five seasons. The image below breaks lefty grounders into three groups, “pull,” “middle,” and “opposite,” defining pull as anything over 10 degrees; middle as anything between 10 and negative-10; and opposite as anything under negative-10. The same pattern (BABIP increased up the middle and the other way; BABIP level or slightly down to the pull side) holds for right-handed hitters. It’s important to note that most ground balls are pulled; that’s why we see only a small inflation in leaguewide BABIP despite the more noticeable rises to center and the opposite side. Still, as others have noted, the graphs above aren’t what we would expect to see if the shift were working wonders. So how is it possible that leaguewide BABIP hasn’t fallen as shift totals have climbed? One possibility is that hitters have adapted to the shift by pulling the ball less often. The table below lists the percentages of ground balls pulled by left-handed hitters (≥ 10 degrees) and right-handed hitters (≤ negative-10 degrees) over the last five seasons. There’s no evidence of a meaningful difference. It might be that shifts have snagged some extra liners or gotten into hitters’ heads enough to hamper their performance in other ways. Another possibility — albeit one that’s impossible to prove with publicly available data — is that batters are hitting the ball harder, in which case the shift could be counteracting what would otherwise be a more pronounced BABIP increase.1 Lastly, it’s conceivable that not every team has made the most of its shifts. Some teams are more sophisticated shifters than others: While their rivals use spray charts, which reveal batted-ball direction but not batted-ball speed, the superior shifters gather velocities and angles from ball-tracking technologies like TrackMan and HITf/x and account for the pitcher’s impact. To pick a plausible number, let’s say that efficiently shifting can save a team two wins, or roughly 20 runs, in a season. If only 10 teams are doing it properly, the result is an almost unnoticeable 0.04 runs saved per major league game — and that’s if the worst shifters aren’t giving runs away. We can’t say for sure that the shift doesn’t work; it might be that other factors are masking its impact on the overall stats. And even if the shift is not suppressing offense now, it might do so when every team learns to align its defense in an optimal fashion. The impending arrival of MLBAM’s Statcast system could apply more pressure to the late adopters. But why stress over singles that the shift might steal in the future when baseball is already hemorrhaging hits in other ways? We know that the called strike zone has dropped and expanded dramatically over the past few seasons — perhaps as an unintentional byproduct of MLB’s efforts to make umpires more accurate — which some estimates suggest might be responsible for a third of the decline in scoring over the past several seasons. We also know that the leaguewide strikeout rate keeps rising, thanks not only to the zone’s amorphous dimensions, but also to a confluence of other factors, including increasing pitcher velocity, evolving pitcher usage, changes in batter approach, and insightful advance scouting. A shift might make a single less likely; a strikeout precludes any hit. Strikeouts, not shifts, are the imminent threat. Fortunately, Manfred can confront that threat. The league could revert to an earlier, smaller strike zone. It could extend the DH to the National League, aping its solution to an earlier scoring crisis. It could even adjust the height or placement of the mound or the seams or the bounciness of the ball — riskier approaches, but more likely to make a difference than abolishing the shift. Over the past few seasons, we’ve seen a significant, undeniable increase in shifting coincide with a significant decrease in scoring, so it’s only natural to infer a strong causal link between the two very visible trends. However, while Commissioner Manfred might have too much on his plate to investigate BABIPs, his assistants should dig up the data before he makes a mistake. Outlawing the shift might seem like an appealingly simple solution to baseball’s offensive drought, but interfering with the freedom of fielders would be like performing an invasive procedure on a patient’s leg when his injury calls for arthroscopic arm surgery. Thanks to Baseball Savant and FanGraphs for raw data and Rob Arthur and Daren Willman for research and graphing assistance. Although it’s hard to square the “batters hitting harder” theory with the fact that the rate of home runs per batted ball is down.